Twenty-six years ago, in 1991, at the Society for College and University Planning’s annual conference, I gave a presentation on the faculty office. There have been significant and dramatic changes in higher education since then. A quarter-century later, whither the faculty office? 13,043,100 enrollment – undergraduate, graduate, and professional 356,300 full-time faculty. In 1991, there were 13 million students enrolled in public and private colleges and universities with 356,300 full-time faculty. Today, there are 20 million students enrolled and 783,700 full-time faculty – an addition of 427,400 full-time faculty. Higher Education added the equivalent of 76,500,000 gross square feet of faculty office space. So, whither the faculty office? In 1991, I categorized the various ways that a faculty office could be used. Personal activities – quiet space, eating, etc. The faculty office continues to be a multipurpose space but the size, design, furniture, and technology has been changing as well as the need to facilitate communication and collaboration. The purpose and use remains the same, although the time spent on these activities probably has changed depending on the experience, age, and responsibility of the faculty member. The size of a faculty office has changed, sometimes by intent and design, other times by accident – available space divided or subdivided. There was then, and there is now, no agreement on the appropriate size of a faculty office. Faculty offices in renovated or retrofitted buildings are sometimes in spaces designed for some other purpose: typically, a classroom divided into three or four offices or a residence renovated for a small academic department where a bedroom or living room is used as an office. There are, of course, specialized offices, such as for music or art programs. Humanities and social science departments will sometimes push for larger offices claiming their STEM colleagues have offices as well as their own research labs and other support spaces. State standards for faculty offices for public universities ranged from 100 NASF to 180 NASF (Net Assignable Square Feet). Usually, the higher square foot number included prorated amounts of space for conference rooms, administration, and service. The typical size of a faculty office for a public college or university was 120 NASF according to standards. The Western Interstate Commission on Higher Education (WICHE) guidelines for a faculty office was 110 NASF to 130 NASF. The Council of Educational Facility Planners (CEFPI) guidelines for a faculty office was 110 NASF to 140 NASF. There were various space allocation models in use at that time, such as at the University of Minnesota and Illinois University and these models used a range of 120 NASF to 130 NASF. Guidelines for faculty offices have not changed overall. The typical size listed in many state guidelines is still 120 NASF although there is a range of 100 NASF to 135 NASF. CEFPI has increased their suggested office size to 140 NASF to 180 NASF. Usually an office smaller than 100 NASF for a full-time tenure/tenure track faculty is considered substandard. Substandard – that’s a harsh word – below standard? Inferior? Poor? Deficient? Perhaps a better term to describe a small office is below average. A number of private colleges and universities are moving toward a range of 140 NASF to 160 NASF for a typical faculty office. Cornell, M.I.T., and Stanford all are using 160 NASF as the size of an office for new construction. Lafayette College suggests 200 NASF for a faculty office. Recently, on a small residential liberal arts college campus, the pedagogy evolved to embrace seminar-style teaching. The faculty urged a shift to larger offices so that each office could also function as a seminar room. The faculty claimed that the college wouldn’t need classrooms. Wisely, the decision was not to move in that direction. We typically recommend 140 NASF to 160 NASF. The size of an office is shaped by the activities that take place within it as well as by the furnishings and equipment. A place to sit, a place to work, a computer, what has changed? A typical faculty office will contain most, if not all, of the furnishing and equipment listed below. Depending on the size of the office, there might be room for a small conference table. Flexibility and the ability to modify and change the office is important. Furniture is lighter and more colorful. 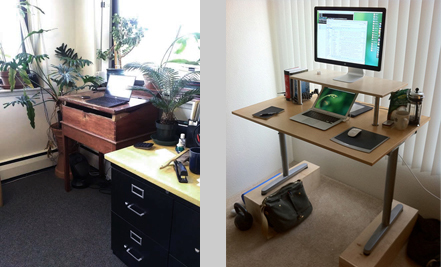 A standup desk might be in addition to, or as a replacement for the traditional desk. A printer/copier/fax is also becoming common in the faculty office. So too, is a laptop in addition to or as replacement for the desktop computer. One monitor or two? It is too early to say whether the faculty’s individual library – the collection of private books – is shrinking as online journals and resources increase. The desire to personalize an office has not changed. The same forces of change that were impacting the nature of the faculty office are still having an impact almost three decades later. Three forces will have spatial impact on the faculty office. The first is changes in undergraduate teaching. There is a renewed national focus on undergraduate teaching. Institutions are reviewing program content as well as teaching methodology. The faculty office, as a teaching environment will be an important resource in any improvements to undergraduate teaching. The second force that will have spatial implication for the faculty office is the extraordinarily rapid change occurring in computer and communications technology. During this coming decade the electronic transmission of voice, data, image, and video will become faster, simpler, and cheaper and probably integrated in some fashion with he computer on your desk. Collaborative research, writing, and teaching is possible today and will be occurring more frequently in the next decade. Collaboration will be facilitated by multimedia conferencing within the faculty office. The third force is the changes that are occurring in architectural building systems. All the previous forces are still at play today. Undergraduate teaching has evolved into undergraduate learning and its impact on the office is shifting. Active earning is occurring in other spaces and the faculty office is becoming less of an instructional space, although we still find faculty offices being scheduled for various small course sections. The use of Skype, Facetime, Google Hangouts, Zoom, and other telecommunications software has made any office a communication hub and a production studio. The cost of new construction and renovation are pushing colleges and universities to explore various options for reducing space. The size of the faculty office is an obvious target. The desire to reflect the “real world” is pushing colleges and universities to find ways to be more collaborative and interdisciplinary in both instruction and research. Many corporations have embraced the open office. It will be interesting to see whether academic departments or colleges will embrace the cultural shift that will be required in an open office environment with their shared small group collaboration areas, conference rooms, huddle rooms, quiet areas, and private areas. The mission of a corporation is different than that of an academic program. Teams of people working together to accomplish some task or to create some product versus individual faculty preparing for their course, advising students, or working on their research. Research is becoming interdisciplinary, but it is just as likely with a faculty member at another institution or another country. The ability to conduct most faculty activities from anywhere with an internet connection is a change from the early 90s and has led to less time spent on-campus for many faculty. While the pros and cons for individual and departmental productivity and effectiveness will be sorted out, in the meantime, what is the impact on demand for faculty office space? It will be interesting to see the impact on faculty attraction and retention in an open office setting. Interestingly, the faculty office policy issues have not changed in the intervening years since the 1991 presentation. There are new issues that will need to be addressed. Who should have an office? What type of office should be provided? How large should it be? Should the office be near colleagues, or near research labs? We often hear that part time faculty or adjunct faculty do not participate in the day to day life of the institution. They come to campus, teach their course, and leave. Often, part time faculty have no office, or have a small, shared, Spartan space and it’s no wonder that they don't stay on campus. Providing improved facilities for part time faculty can open opportunities for expanded interaction among faculty and students and lead to a stronger academic program. The same policy issues continue along with new questions. What is shareable, and who should share? Open office space or not? Should all full-time tenure/tenure track faculty have an office with a window? Should all faculty offices have their own temperature controls? Should faculty offices be grouped by department, or distributed so that departments are intermixed? How important is department identity? Should the chair of a department have a larger office? Looking ahead 26 years what will the faculty office be like? How will the ability to connect virtually anywhere and anytime impact the way in which faculty will work, mentor and advise students, interact with colleagues, write and do research? How will the faculty office change in response? It is fun to imagine. 1 Chronicle of Higher Education Almanac 1991 and 2016.